Super strength stainless steel bars manufactured by Macalloy in Rotherham are being used in the Izmit Bay Bridge, set to be one of the longest suspension bridges in the world. The suspension bridge over Izmit Bay in Turkey is an extremely complex project with a free span of 1,550 metres between its pylons and a total length of about three kilometres. The pylons will be made of steel and have a height of 250 metres. It has been designed by Danish architects, Dissing+Weitling. At a total project cost of €800m, the overall construction will require some 85,000 tonnes of steel and about 125,000 cubic metres of concrete. It is being constructed by Japanese contractor IHI, with COWI serving as consultant, and is scheduled to be completed in only three years. The bridge is being built in one of most seismically active areas in the world, which places additional demands on the bridge's design. It will be made earthquake-resistant by building its pylons on a concrete foundation that rests on a large gravel bed the pylons can slide on in the event of a major earthquake. 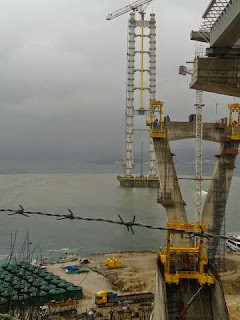 Fully threaded 40mm and 50mm Stainless Macalloy Bar will be used to hold down the bridge's towers in the sea. Macalloy was the first company in the world to develop a post tensioning bar system in the 1940's and the product has evolved to include a unique fatigue resistant thread form that provides low lock off losses on stressing. Macalloy's system is used in holding down bolts, ground anchors, external post-tensioning, hangers, lifting rods, pile testing and stressed connections. Macalloy S1030 is a martensitic nickel-chrome alloy steel, hardened during manufacture to attain the specified properties. Macalloy systems are already used in the impressive Millau Viaduct in France and the Navia River Viaduct in Spain. When completed in 2017, the Izmit Bay Bridge will be the fourth largest suspension bridge in the world just pipping the Golden Gate Bridge in San Francisco.